Here are two pics of my tank for her to lay in. It is a 20 long tank. 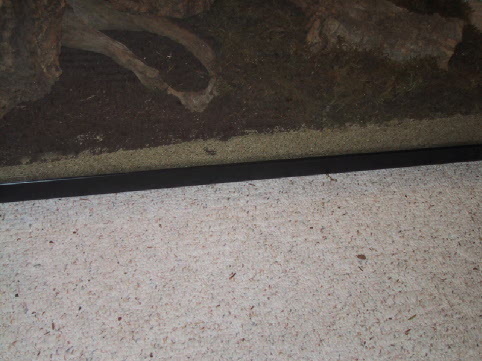 There is a layer of about 1 1/2-2" of sand on the bottom, topped with a 2" layer of bed-a-beast, and half of the bottom covered by about 2" of green moss. I couldn�t find sphagnum anywhere, so that�ll have to do. It doesn�t look as deep as it actually is, I had to point the camera down so I didn�t get one of those flash bright spots. Let me know what you all think. I am going to keep the light on 24 hours a day to keep her at the best temps. 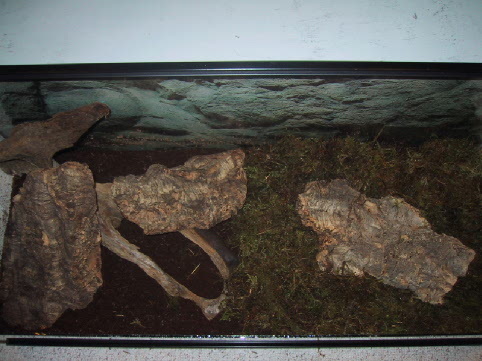 i also have a slab of cork on top of the moss, it has been said, by jobi I think, that they like to lay underneath things. It's small, in case she doesn't. I welcome opinions.